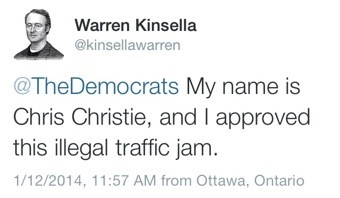 The most insightful comment I’ve read on why this is so damaging to Christie is that in the rural strongholds of the Republican party, having your ability to get from point A to B via traffic snarls is a major time-waster– when you are driving 50K to the Doctor or 25K to the grocery store, and not 1 or 2K, this has a major impact on your quality of life. What I found interesting is the spin. Guilanie was on a Sunday show saying Christie would not lie about something so big, funny thats the same line Tory used to defend Stephen Harper. Yes they think we are idiots. Rob Ford would never lie about smoking crack either. This is an interesting story for when it broke on Friday every pundit in the land said “Way to go Christie” because he was swift in tossing his aides off the ship. However within almost minutes responsible journalism and a nasty newspaper had pointed the episode back to where? Shades of PMSH – his office and questioned his personal involvement. Now Rupert Murdoch has tossed him under the bus and the Independent Inquiry will show that Christie knows a lot more than he is telling. But where are the pundits that applauded the initial response? With egg on their faces because the once mighty “Truth Fighter” and “Man on top” of the situation may not be what he seems. Still just goes to show what an independent enquiry can do if given the chance. No wonder King Stephen doesn’t want one! I think Chrustie is toast as far as his GOP leadership bid is concerned. He didn’t know what his closest appointees were up to? That would never happen in Canada. Ah, won’t hurt him…he can get Gazebo Tony to give him advice on how to ride it out. Rob Ford, Chris Christie — portly, aged frat boys with entitlement issues and poor judgement. Who me? ; no not me; I know nothing, reminds me of that portly gent from years ago– Sgt. Schultz — “I know nothing”. Yeah, the Sgt. Schultz defence– the public will buy that– sadly, some will.